We understand that keeping your tenants happy is your number one priority. Therefore, we make it ours, whether it’s a simple service call or an entire commercial water heater replacement. We have a crew on call 24 hours a day to make sure your downtime is at a minimum. We also stock many parts for all major brands of commercial water heaters and circulator pumps, so we can take care of the problem the first time out. Our long-term relationship with our suppliers also gives us access to commercial water heater deliveries 24/7. 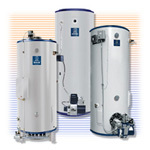 We can also customize an energy saving commercial tankless water heater system to fit your needs. Tankless systems have shown significant energy savings in all types of commercial applications, such as apartment buildings, restaurants and hotels. Please call us today for emergency service or Contact Us for questions or service requests. We are your sewer experts! Our technicians have a full line of drain cleaning machines at their disposal to tackle the most difficult emergency backups and sewer problems. If you are having chronic problems with a line, we can customize a preventative maintenance high pressure water jetting program to keep drain lines clean year around. If a problem calls for an underground repair, we can look at the inside of the pipe with our color video inspection camera to find exact locations of the problem areas before digging. Think of us the next time a gas or water leak occurs in your building. We repair and replace all commercial water and gas piping. We also specialize in resolving those “hard to find” or “mystery leaks.” Our on call after hours staff is always available for those emergency leaks. Is the water line leaking outside the building or in the street? Main sewer line collapsed, broken or full of roots? D. W. Bahr Plumbing & Heating, Inc. has all the resources available for underground water and sewer line replacements. We stay with you from start to finish. We do all of our own excavation, cutting down on our costs and yours. Let our plumbers install and service all your commercial fixtures. We service everything from retail stores and ADA apartments to restaurants, hotels and hospitals. You can rest assured that the job will be done in accordance with today’s ever changing ADA standards. We will be happy to work in conjunction with your general contractor on all those larger jobs, like an ADA apartment conversion or a new commercial kitchen or bathroom. Our backflow certified technicians are able to troubleshoot, install, test, service and certify all types and sizes of backflow preventers. Contact Us today to schedule service or inquire about backflow preventers and services. We service all major types of water based commercial heating equipment, such as hot water and steam based units as well as recirculating pumps and controls.